The first Bar Mitzvah to be held at the Southampton Hebrew Congregation in over a decade has left a family and a community deeply moved and inspired. 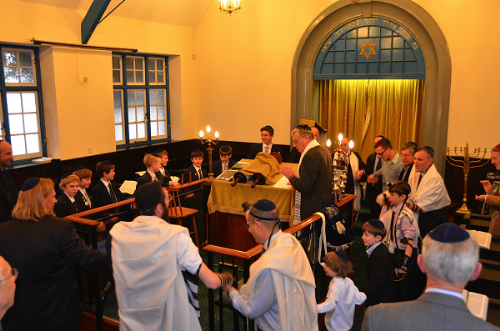 On Thursday, 12th December 2013, 13 year old Sam Rachman of Winchester put on Teffilin for the first time and read from the Torah, followed by a lively dance with family and friends around the Bimah. The Rachman family and the congregation welcomed guests from Winchester, London and even from Canada, Israel and South Africa, to join the celebrations on this momentous occasion. 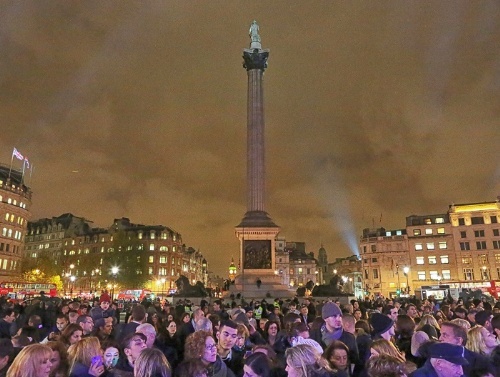 On Thursday 28th November over 7,000 people joined Mayor of London Boris Johnson for the annual Chanukah in the Square Mayoral menorah lighting. Set in the landmark location of Trafalgar Square, Europe’s largest Menorah will stand bright for the entire 8 day duration of Chanukah, reminding Londoners of the miracle of the festival of light; and reminding Londoners of the religious and cultural contribution the Jewish people make to this diverse city. Chanukah in the Square was organised by Chabad Lubavitch UK, the Jewish Leadership Council, the London Jewish Forum, and supported by the Mayor of London.